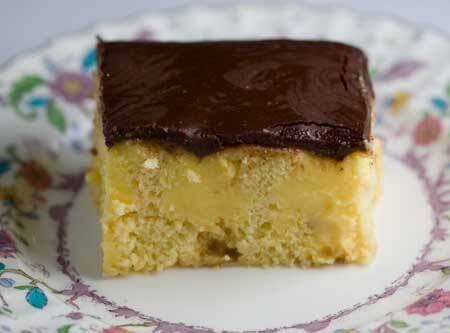 An easy Boston Cream Pie flavored poke cake made with pudding, cake mix and a simple homemade glaze. Bake the cake as directed for a 13x9 inch pan. Let the cake cool for 15 minutes, then poke holes in the cake with the handle of a wooden spoon. Try to space them a little less than 1 inch apart and make sure they're pretty deep. Combine one box of pudding mix and 2 cups of milk in a large mixing bowl (preferably one with a spout). Using a handheld electric mixer, beat just until smooth - -about a minute. Pudding should still be thin and runny. The point is to just get rid of the lumps. Carefully pour the pudding into the holes. Do this slowly until holes are completely filled, but pudding is not flowing all over the top of the cake. You’ll probably have some leftover pudding. Put the cake in the refrigerator and chill for about an hour. At this point, the pudding holes should be about half or a little more than half full. Make the second batch of pudding and repeat, fill the holes until the pudding comes to the top, but don't spread remaining pudding over the top of the cake. Save it for something else. Prepare the topping. In a large (3 quart), nonstick saucepan, melt the butter. Add the chocolate and stir over low heat until chocolate is melted. Let cool for 4 minutes, then with a wooden spoon, beat in the sugar and boiling water, beating until smooth. Beat in the vanilla. Pour over the cold cake. Return to the refrigerator and let the frosting set. Chill until ready to serve.